Last Friday night, we went to see and hear Robert Webb reading from his book, 'How not to be a boy' and being interviewed at the local City Library, as part of a tour. 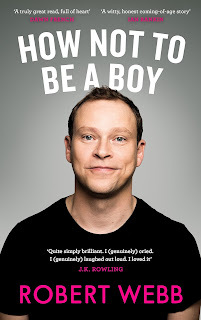 For those who don't recognise the name, Robert Webb is a comedian ('Peep Show', 'Back', 'That Mitchell and Webb Look'), but he is proudest of his writing - for the comedies mentioned and work for other comedians too. While Peep Show is not really my cup of tea, it has been very successful. I did watch and enjoy That Mitchell and Webb Look. He has also given a winning performance of the famous audition scene from Flashdance for Comic Relief in 2009, which endeared him to many (click here to see it). He originates from Lincolnshire and occasionally comes back, but as he said, most of his family are dead, so he doesn't visit as often as he used to. He was incredibly erudite, answering questions from the audience with aplomb and being genuinely funny. Many of these questions centred around gender stereotyping and he gave some thought-provoking, sensitive answers. Needless to say, Chris bought his book which Mr Webb signed and it is next on my reading list. It has had really good reviews. I think it will be quite challenging in places, but it includes important issues obviously close to his heart, as well as being a memoir. Does the book need to be written? Does the book need to be written by you? Does the book need to be written by you now? Edited to add: I am about a third of the way through and yes, it is well written and interesting, but (and it could be a big but for some readers), there is extremely strong language from the start and throughout. (I thought I should let you know). I have started the book and am enjoying it, but there is some bad language in it. This doesn't seem to be used gratuitously, but can be found offensive by some. Not an artist I was aware of - thanks for the introduction. And how I wish more would-be writers followed his advice. Thanks, EC. I thought it was very good advice too. So far, I am enjoying the book although there is a fair bit of bad language. However, that hasn't put me off!